wallpapers news and reviews for Windows Mobile Pocket PC, Palm, Microsoft Smartphones and Symbian cell phones. In the recent pirsuit of "swooshiness", which we can say was started by the iPhone, Windows Mobile developers realize this need and started working. V2R Active UI proves that it's easy to add swooshiness on all existing Windows Mobile Pocket PCs and Smartphones. V2R Active UI has been developed as a Todayscreen plug-in (for Windows Mobile Pocket PCs) and Homescreen plug-in (for Windows Mobile Smartphones) with a standard V2R icon and animation set. The V2R Active UI plug-in allows users to access the most wanted applications, settings or documents directly from the Today-/Homescreen. The standard version, which is for free, is shipped with predefined templates for animations, designs and functionalities. On the V2R Web page users can find more animations, designs and functional plug-ins which will feed all the different user needs. In the future, V2R will regularly release new free and payable plug-ins for the V2R Active UI with different plug-in sizes, animation styles and functionalities. V2R Active UI has also wide collection of icons and animations sets available and is available for free download at Freeware Pocket PC site and Smartphone Freeware site. Netwasp, who develops for Windows Mobile, has just announced the release of FlashThemes Player 2007. 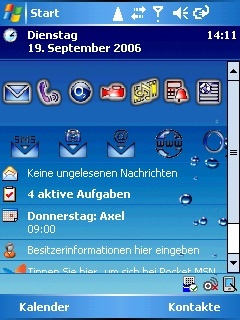 FlashThemes 2007 gives every Windows Mobile PocketPC owner the abillity to run animated Pocket PC themes on their Today Screen regardless of the device, screen layout or even limited space available on the screen. 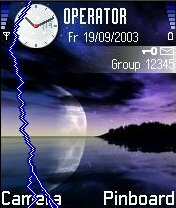 FlashThemes Player 2007 supports any Windows Mobile PocketPC device, running on WM2003, WM5.0 and even WM6.0. FlashThemes' unique Scale Management System ensures that the Pocket PC themes you get work seamlessly on any of the current screen layouts (Portrait, Landscape and even Square Screens) while not disappearing off the end of the screen leaving you to scroll to see the animation. There is even an Icon Tray Manager to allow you to hide icons and free up valuable Today Screen space for your cool animations to work in. There are also 12 high quality themes included with the player. Nice indeed. * Animated your Today Screen with FlashThemes 2007. * WSIWYG themes: FlashThemes aligns animations with the bottom of the screen allowing for the creation of the most beautiful animated themes to date. * Includes a dozen really good quality FlashThemes Pocket PC themes! FlashThemes Player 2007 is available for order here. Real madness has happened into the mobile world after the introduction of the Apple iPhone. Multi-touch advantages, skins, themes, customization and every single point of view you can imagine was discussed on forums and threads over the net. Of course there are some cool this about it like themes for Pocket PCs and Smartphones, which indeed looks really good. Here is one new so called Another iPhone pocket pc theme skin which is not exact replication of Apple's iPhone but is cool. It is very nice and smooth looking iPhone today screen theme skin for your Windows Mobile powered Pocket PC, which is best working with Windows Mobile 2005 on QVGA display. Another iPhone pocket pc theme skin is available for free download at Freeware Pocket PC site. Watching at Today Screen of Pocket PC devices is one of most done things, which you do your device. I bet that if you see there beautifull girls like Adriana Lima and Teri Harrison (i am talking for the mens using pocket pcs, sry ladies i will get themes for your taste soon) you will be full of happines and your eyes will be trully enjoyng what they are seeing. If you want to have them on your Pocket PC device just go to Freeware Pocket PC site or click here for Adriana Lima today screen theme skin and here Teri Harrison today screen theme skin. Do you want a new theme for your WM Smartphone. If yes you will be happy to know that the very nice and smooth looking Clown Fish today screen theme for your Windows Mobile powered Smartphone is available for free download. There are two version of it in the zip file - one for Facade and one Standard version which uses only standard or free plugins. 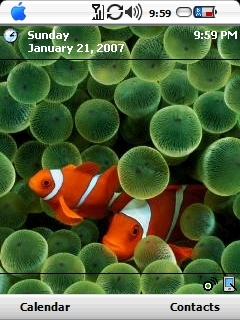 Clown Fish today screen theme is available for free download at Smartphone Freeware site. Note that it is working best with Windows Mobile 2005. Ever wanted to create your own Today screen or Home screen theme? Now this PhoneThemes Studio toolkit lets you do that and even publish and sell your phonethemes for Nokia Series 60, Windows Mobile PocketPC and Windows Mobile SmartPhone devices. The toolkit will publish the themes you create for your own device play and test on. When you're ready to begin selling your themes the toolkit will upload then directly into our server, creating all the necessary animated preview images and allow you to set categories, prices and put in a description. Themes are listed both on the Internet and mobile portal and will also be available for sale via SMS in applicable countries. The toolkit is easy to install and registration is also easy plus there’s a quick start guide to get you up and running straight away. Download the toolkit for free for Pocket PC, Smartphone or Series 60, install and start creating and selling your own animated themes now. Spb Software House unveils Spb UniThemes 2.0 - the improved technology for changing Pocket PC look-and-feel. Every UniTheme is a complete set of skins for all skinnable standard applications, like Calculator, Dialer and Windows Media Player as well as Spb's own Pocket PC applications, all designed in one style. With new 2.0 version Spb Software House proposes 6 new and updated UniThemes with smart installers and improved Windows Mobile 5 support. One of the biggest Pocket PC disadvantages is different look and feel of standard programs like Calculator, Dialer or Windows Media Player. These programs are the most used standard utilities but they have entirely different appearance in color and in the way the buttons are represented. It gives the users an uncertain feeling when using the device. Such inconsistent look and feel is one of the reasons that people tend to choose other devices with different operating systems. Spb Software House solves this problem by releasing UniThemes 2.0. This technology gives a consistent look-and-feel to all standard Pocket PC applications and to popular Spb programs. Each UniTheme includes skins for all of the standard skinnable Pocket PC applications (the Today screen, Windows Media Player, Dialer, and Calculator) as well as skins for all of Spb's skinnable bestselling applications (Spb Pocket Plus, Spb Time, Spb Weather, Spb GPRS Monitor, Spb Finance, and Spb Full Screen Keyboard). With this new version of UniThemes the installation process has become much easier. While only experts could install all the skins before, now a new smart installer that comes with each UniTheme 2.0 makes skin installation easy even for an average user. Other new features include improved support for Windows Mobile 5 devices and for new Spb products. Spb UniThemes also help OEMs to distinguish their devices from competitor's products. "Individualism has just started with some OEM", - said Sebastian-Justus Schmidt, CEO of Spb Software House, - "we have the first contracts with OEMs where the design of the software fits the device itself. This will strengthen the OEM brand and it is a great benefit for their customers". There are almost no limitations for future aspects of using individual skins, such as for special target groups, corporate design, etc. Spb has released six different UniThemes and will release more soon. Further information about Spb UniThemes 2.0 can be found here. Those of you who use a Symbian phone and want to change their screensaver today may be happy. We have just received a whole set ot seven screensavers and have uploaded them to Symbian Freeware site. They are fully compatible with Nokia 3230, Nokia 6260, Nokia 6600, Nokia 6620, Nokia 6630, Nokia 6670, Nokia 6680, Nokia 6681, Nokia 7610, Nokia N70, Nokia N72 and below you can see screenshots of them and choose which ( or all ) do you want and get it. Themes you all have on your Pocket PC devices make your experience with the handheld quite better of usual common winds appearance. ThemeGenCE is a Free application for PPCs which lets you change the appearance of your Today Screen and Start menu. ThemeGenCE helps you to build the TSK (theme file) by compiling the file of information (Extension "000") and by building the images which will be attached to your theme. It puts the whole in a CAB file renamed in TSK and you are ready to load your theme. It also lets you create themes in QVGA and in VGA modes with different images for Portrait and Landscape mode. ThemeGenCE is available for Free download at Freeware Pocket PC site. For those of you who are in fever with the Football World Cup 2006 tournament in Germany we are pleased to announce these great Pocket PC themes for free download. They are all made by guy who calls himself Yamskie. You can preview them below and if you like them you can download them for free. We hope all of you who are football fans will like them.